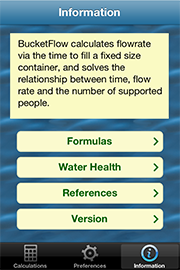 By using a simple time measurement, BucketFlow can calculate the flow of water into a fixed size container, and through WHO recommendations estimate the number of people that the flow could support. Being able to easily determine the flow-rate of a water source is important for many situations. For example a farmer may want to know how much water he has available for his crops, while an aid worker may want to know how many people could be supported from a given spring. However when you are out in the middle of the countryside is is very likely that you will have little in the way of tools to help you measure a flow-rate. But this is where BucketFlow comes to the forefront! 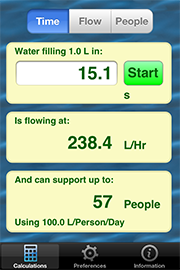 The BucketFlow program is designed to help people estimate the flow-rate of a water source by simply timing how long it takes to fill a container of a known size. Just divert the flow into the container and use the stopwatch-like start and stop buttons to measure the fill time and then BucketFlow will convert that time into the flow-rate. The program is easy to use and contains all the information on how the calculations are performed and references to external material that further expands on measuring flow-rates and the health aspects of potable water usage. Calculate flow-rate and supported population for a fill-time. Calculate supported population and fill-time for a given flow-rate. Calculate fill-time and flow-rate required to support a given population. 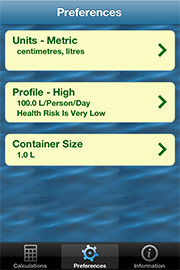 A summary of World Health Organization (WHO) water quality criteria and an explanation of the per capita water profiles used by BucketFlow. Version information of the currently installed BucketFlow program.